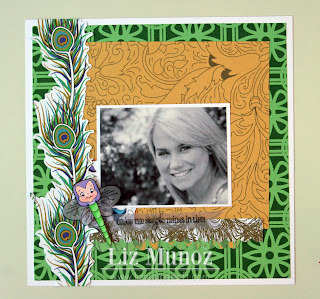 Liz's Paper Loft: Jinger Adams Featured Designer ~ Layout! Good Morning Everyone! Hope you had a wonderful weekend! I'm so excited to be the Jinger Adams Featured Designer! Today I wanted to share with you this darling layout using Jinger's Bella Vita from her new paper line! Don't you just love how VIBRANT the colors are! The green pattern paper is so fun and the peacock feathers are FABULOUS! 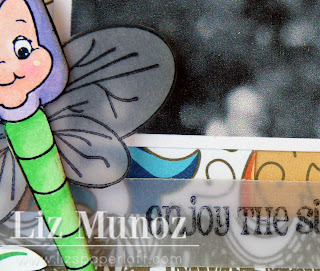 I stamped the uplifting sentiment from My Creative Time, on vellum using a solvent based ink. 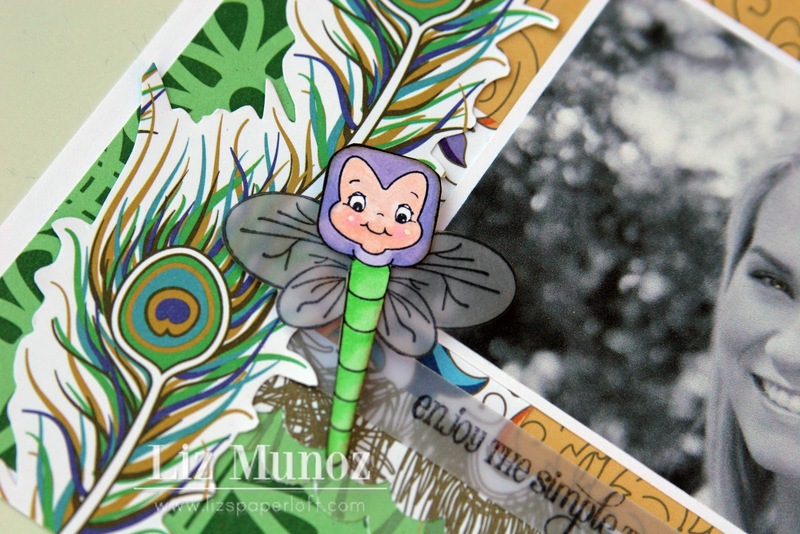 Oh, I just had to add this darling Peachy Keen Faceless Bugs stamp, colored with copic markers! Make sure to check out all the papers and trims that coordinate with Bella Vita and Gypsy Queen! They are AMAZING! for all of her FB friends she is giving a 15% off discount at checkout with the coupon code "birthday"
TFS and have a GREAT Monday! Beautiful, Liz! That little bug is so cute!!! Beautiful LO. Love the design. Really beautiful! Love the feathers & the colors! Liz ~ Lets start this off by saying your daughter is GORGEOUS!! Beautiful picture!! LOVE that little bug and the design ~ GORGEOUS!!! Always such a pleasure stoppping over and see your creations!! Wow!! This is gorgeous!! I LOVE those feathers!! So beautiful! So fun seeing a layout with the sketch! LOVE it!!! So glad you joined us this week at Peachy Keen!!! This is such a beautiful layout Liz!! Thank you for playing along with us again this week over at Peachy Keen Stamps!